Red Alert 2: Yuri's Revenge! 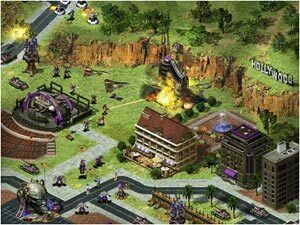 Westwood has released a challenging expansion pack to their hit seller Red Alert 2. Picking up where the story left off, we find Yuri (the mind controlling Soviet), threatening the United States of a worldwide takeover using mind control devices he has been strategically and secretly locating all over the world. The U.S., with the help of Professor Albert Einstein, have some last resort options to pursue. As a former master of RA2, I was anxious to play this release but was quickly destroyed in the very first mission. I found myself needing to take a quick tour of the Red Alert 2 firing range before returning to the field. In regard to new features, the game has many new units, tanks and goodies for the Allied and Soviet forces. In addition, there is an entire new force controlled by Yuri that can be commanded in skirmish mode. The biggest strength of this release is the story line, which is rich and full of high quality cinematic scenes. You look forward to the scenes between missions, to find out where the plot is headed next. Being able to control the Soviet or Allied forces against Yuri will allow you to play the story line twice with two different twists and endings. It appears the expansion pack has plenty to keep the Red Alert 2 fan busy for quite awhile, including multiple difficulty level settings. Remember, it might be a good idea to play a few RA2 computer skirmishes before loading up Yuri's Revenge, to refresh your memory on just how to command your forces to victory. Yuri's Revenge is available now at Gameport for $27.50!